CIf you ever take your dinghy cruising on San Diego Bay you may want to tie up for a few hours to go walking, visit the Maritime or Midway Museums or Seaport Village or stop to eat. But unless you opt for a meal at Anthony’s, the lone Embarcadero restaurant offering dockage on a first-come, first-served basis, you’re out of luck finding anywhere to tie up, barring a fairly long yet scenic walk. Dinghy docks should be readily available and conveniently located for cruising boaters to use. The reality, as I recently confirmed when I searched for legal dinghy docks, is that they’re remarkably few in number and often poorly located and maintained. Embarcadero/Harbor Drive: The Port District of San Diego provides two public docks without time restrictions. The larger dock is located east of the Coast Guard Station and is the closest dock to Anchorage A-9. Signage on the pilings restricts docking to boats under 12 feet. The dock to its east, the Laurel Street Dock, offers a pumpout station (and nearby public heads) and limits dockage on Saturdays 8 a.m. to 4 p.m. because of Coast Guard Auxiliary boat inspections. These docks are your only non-restaurant choices for visiting nearby tourist attractions. 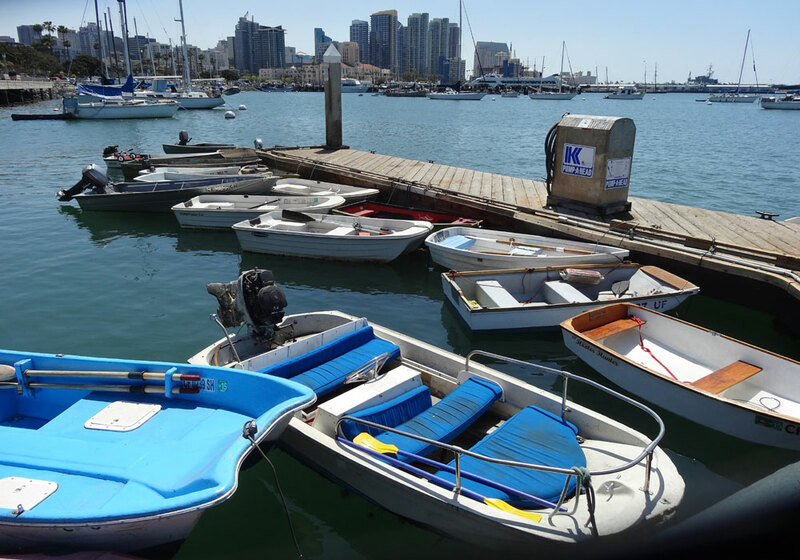 After looking at these docks and feeling concerned about the safety of leaving a small boat so vulnerable, I called the San Diego Harbor Police, who deemed them “safe enough,” assuring me that theft is not a major problem. Only four stolen dinghies were reported in the last year. But, police advise, be sure to secure boats to the dock with a stout chain or cable and sturdy padlock. Shelter Island: America’s Cup Harbor offers three dinghy docks. The largest is behind the Marine Exchange, with no time restrictions and offering easy access to Shelter Island’s host of marine services, restaurants and nearby shopping. Again, be prepared to secure your boat to the dock with a chain or cable and padlock. Close by, new Intrepid Landing offers two hours dock-and-dine, not tied to any restaurant. Across the harbor, Sun Harbor Marina, site of Jimmy’s American Tavern and Pizza Nova, offers two hours free public dockage. Boats can also pull into the police dock at the west end of Shelter Island, but need to pay for a day’s dockage. Coronado: Ferry Landing (not to be confused with the actual ferry dock) offers four hours free dockage at sturdy, recently rebuilt docks, first-come, first-served. Signs warn of “rough water.” Be prepared to bounce and tie up securely. The docks adjoin several restaurants and offer your easiest access to grocery stories, a pharmacy and other convenient shopping. Mission Bay: Aside from dock-and-dine at Paradise Point Resort and the Hyatt Hotel, your only option for dockage is the public dock in Santa Clara Cove near the Mission Bay Aquatic Center. It’s limited to about two hours, enabling you to walk to Mission Beach restaurants and shopping. Fortunately, many marinas with restaurants now offer dock-and-dine options. Call your favorite waterfront restaurant to inquire. It’s a real shame San Diego can’t invest in more dinghy docks for boaters both local and visiting to enjoy the area more. When Red Sail was open the public dock was and still is an embarrassment to San Diego. All this talk about football and soccer teams, few more docks to help boaters spent]d more money locally would be a great return on tax payers investment. Agreed! We’re visiting before the Baja Ha Ha, and can’t seem to easily dinghy to services we’d love to spend money at like groceries and laundry. The Port of San Diego has gone to great lengths throttling back, or eliminating dingy docks, just since this article was published. In fact, I can’t think of any place on the Bay where one could go to the grocery store, pharmacy, shopping mall, movies… etc. without having your boat cited for Mooring without the owners consent, a misdemeanor! And the owner, you guessed it, The Port of. San Diego! Dock and dine, sure, make your reservations twenty four hours in advance. Oh, and we’ll be watching you, no side trips! They’ve found away to squeeze every cent from local and visitors alike. Imagine the outrage when all free parking is eliminated! Welcome to San Diego, pay up!